Move Ya Brass is a fun, funky fitness and lifestyle group from New Orleans that promotes creating a community of people from all walks of life. You come as a stranger, but you leave as family. Our mission is to promote a happy, positive and healthy workout environment to help you become the best version of you! New Orleans native, Robin Barnes started Move Ya Brass and the Make Your Move Foundation after overcoming a life altering health issue. It was the wake up call that she needed to recognize the importance of living a healthier life. Through her story, she hopes to inspire others through fun and motivational fitness wear. A Native New Orleanian, Thomas joined the Move Ya Brass Krewe on their 2nd week of its inception and has helped the group with its administrative functions. Thomas’ drive to exercise stemmed from his own battle with Type-2 Diabetes, which drove him to run more and participate in many races & half marathons throughout the city. In 2018, he became a RRCA certified running coach. Raeann moved to New Orleans 6 years ago, from New England, and her passion for running began. Being active has always been an important priority in her life, but she wanted to start running because it would be easy to do no matter where she was traveling to for work. Raeann has been part of MYB since week one and her role is to coordinate strategic partnerships and integrate new and exciting events for the Krewe. That is not a fair question because I LOVE music and choosing a favorite song is like choosing a favorite food. Cannot be done!!! Mary is a small town girl who married a New Orleans boy. She joined MYB in August 2015 after Wilfredo asked her to help coach some of the beginners. After the first run, Mary knew that she had found a group that gave her the same feeling and support of running with her hometown track club. Running has always been a way for Mary to release stress and keep her cholesterol in line. In 2018, she became a RRCA certified running coach. 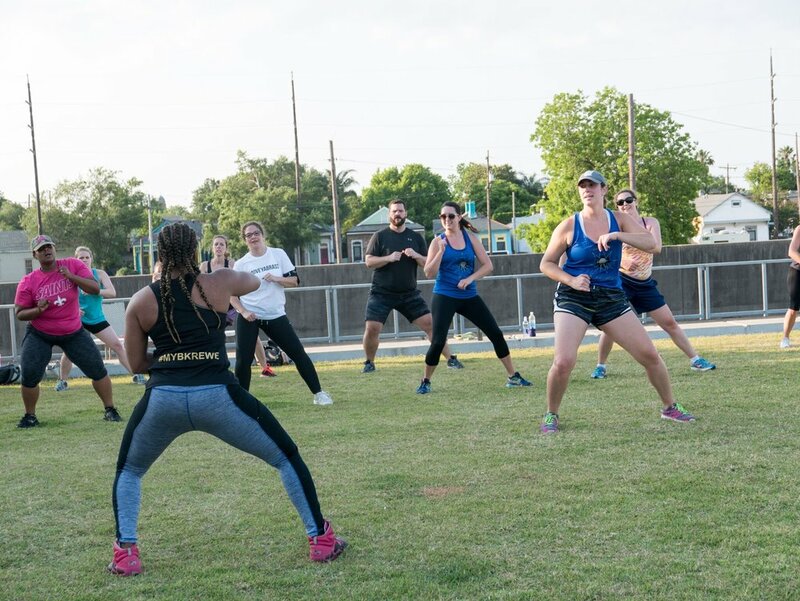 New Orleans Native Shanda Domango joined the MYB Krewe in April 2016 as we launched our Bounce Ya Brass dance cardio classes at Crescent Park. As a Personal Trainer and Professional Dancer, Shanda loves getting the Krewe working and grooving to fun Hip Hop moves with a NOLA twist. A New Orleans native via Honduras. Wilfredo joined the Move Ya Brass Krewe on its first ever group run and was it’s lead runner. Running has become his remedy for Dysthymia (mild depression.) Now he promotes the benefits of running for mental wellness. In 2018, he became a RRCA certified running coach. Ryan was bitten with the running bug after undergoing a cardioversion procedure in 2013 (and afterwards co-worker and fellow MYB member Ben “Santo Loco” Faillos challenged him to a treadmill run at work.) Living on the Northshore, Ryan loves running the Mandeville Lakefront and has biked the entire length of the Tammany Trace numerous times. Jennifer moved to the Northshore in 2002 from Texas. She joined MYB several years ago after seeing the great workout gear at the Crescent City Classic Expo and learning more about the group. Jennifer loves running as a convenient way of exercise and stress relief. She also loves making running a family affair. You will often see her out at races with her husband and two boys.